You're a teacher with an eye on the future, and you want to begin growing global digital citizens in your own classroom. Moreover, you want to make sure you get it right—preparing learners for the world beyond the school walls is serious business, after all. Now there's a new book from the GDCF that not only shows you the path, but also gives you the map, compass, and all the supplies you need to make the journey successfully. It's called Growing Global Digital Citizens: Better Practices That Build better Learners. 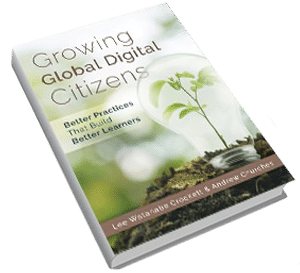 Authored by Lee Watanabe-Crockett and Andrew Churches, Growing Global Digital Citizens provides excellent reasoning and strategies to place your students at the forefront of being global digital citizens for the world of both the present and the future. Technology is one of the biggest “teachable moments” we have today, and with this book we share what we’ve learned working with hundreds of schools around the world. Ultimately, our goal with Growing Global Digital Citizens is to help you transform acceptable use policies and restrictions into a system of cultivating respect and responsibility for oneself, others and everything around you. We'll show you how to begin growing global digital citizens that are responsible, ethical, and compassionate. "Throughout this book, Lee and Andrew provide the why and how for schools, teachers and parents to foster positive digital thinking in our children. Looking to build better practices that build better learners? This is the book to help you and your school community find success." We founded the Global Digital Citizen Foundation with the hopes that this work would grow to empower teachers and students to strive together to solve problems that matter and create a bright future for all beings. This book is an extension of the work of our foundation. Growing Global Digital Citizens addresses how we participate and contribute in the blended physical and digital worlds. Consider it your how-to manual for leveraging the digital world to begin growing global digital citizens the right way, beginning in your classroom. Help spread the word with the shareable infographic from Solution Tree below, featuring the 5 Tenets of Global Digital Citizenship. Begin Growing Global Digital Citizens in your classroom—get your copy of the new book today!